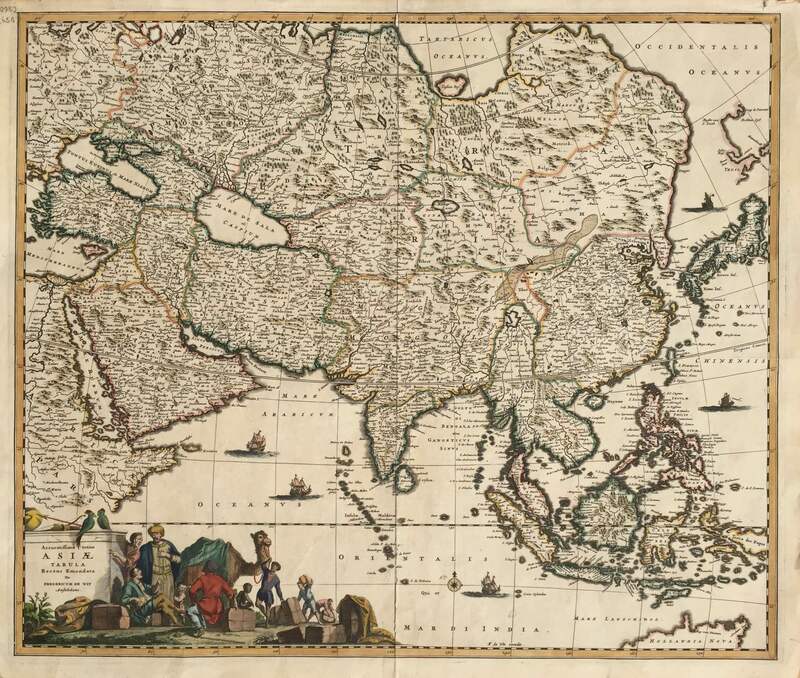 Antique map of Asia by De Wit titled ‘Accuratiffima totius ASIAE TABVLA Recens Emendata Per FREDERICUM DE WIT Amftelodami’. This is relatively early example of Frederick de Wit’s (1629/30-1706) handsome map of the Asian continent in old colour which appeared in several editions of his Atlas from about 1675 onwards; the engraved number plate ‘4’ appears in the upper right-hand corner of the map. The map is very different to de Wit’s earlier version of the continent, ‘Asia Nova Descriptio’, published 14 years earlier and reflects the increased knowledge of Central Asia and China provided by the work of Father Matteo Ricci and the geography of the East Indian Islands provided by the VOC and the Blaeu family of mapmakers who, for three generations were hydrographers to the VOC. Frederik/Frederick de Wit (Amsterdam 1630-1706), was a famous engraver and publisher in Amsterdam. He acquired many of the printing plates of Blaeu and Janssonius when it came to auction. His map were very popular because of the quality of the engravings and the beautiful colouring. After his death his work was re-issued by Pieter Mortier and Covens & Mortier. Pieter und David Mortier were booksellers in Paris and have published a wide range of geographical works. After Pieter’s death, his widow continued the business until their son Cornelius took over. Cornelius started a partnership with his brother-in-law Johannes Covens and established the famous publishing house “Covens and Mortier” in Amsterdam. They have re-issued Atlases of Sanson, de l’Isle, Visscher and de Wit.